To help you achieve your personal breastfeeding goals, we provide nurturing care, education and support. We strongly endorse breast milk as the optimal nutrition for newborns. We also know that, while breastfeeding is natural, it is not always easy, and that each mother has unique circumstances. Our highly trained staff works with you to provide personalized support to meet your individual goals and needs. Lactation consultants provide advice and hands-on help for anything about breastfeeding. In the beginning, they can help new moms with positioning baby, solving latch problems, or handling night feedings. Even after a mom has established breastfeeding, a lactation consultant can help with things like too much milk, too little milk, making the transition to work, or learning to pump. 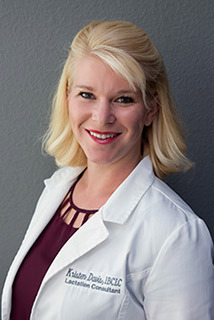 Kristen is an International Board Certified Lactation Consultant, (IBCLC). She has served the families of Temecula Valley and surrounding cities since 2014. Kristen is passionate about helping Moms succeed in breastfeeding and works with local pediatricians, doctors, and specialists to provide the best education and resources to the families she serves. In 2014, Kristen established the Breast4Baby Breastfeeding Support Group in Murrieta, California. This is a free resource for Mothers in all stages of their breastfeeding journey from pregnancy to weaning and has helped hundreds of local Mothers breastfeed their babies with confidence and support. Kristen and her husband, Jonathan reside in Temecula, California with their 3 children. Kristen breastfed each of her children, though it was not easy at times. Two of her children struggled with lip and tongue ties and her middle child spent his first few weeks in the NICU. Kristen understands breastfeeding is not without challenges. She is committed to helping Mom’s succeed in meeting their breastfeeding goals.